I am back in Toliara and it is scary. Not because Toliara is actually scary, but because Toliara is not the forest, and the hoards of people are not lemurs. Its busy and stinky and frenetic. Even facebook is too much for me at the moment. There are way too many options and the status update is way too difficult to find. It is really good to have access to internet though, along with nearly ANYTHING I want to eat. Ah, fruit. The following is a pic that Bronwyn took of me while out in the forest. I am right in the center. Notice the lemur off to the left side. I took this pic out of the car window. Very very different than forest life! I’m sitting in camp doing some data entry and just noticed that Bakira and Fiti are butchering Porky, who is/was my sick chicken. Poor thing is/was terribly sick and couldn’t even stand. I looked at her before lunch and tried to give her some water, but she wouldn’t drink. She had some sort of blockage in her gut. The staff and Felicien are going to eat Porky, but there is no way I am eating a sick animal. Nov 4, 2010. 1:18pm. Camp. Porky update. I went up to take a look at here carcass to see if I could determine what was wrong. Her carcass is now in a serving dish and is completely swarming with flies, which totally grosses me out. Bakira and Fiti were washing something off in the bushes and I asked to see because I thought it was perhaps the ‘sick’ part of her. In fact, it was an egg covered in layer upon layer of necrotic tissue. Poor thing had an egg stuck in her…well wherever eggs get stuck in chickens. Bakira was actually trying to wash off the egg with some water and a machete. Makes sense. The putrid stuck-in-a-dying-chicken egg was destine to be added to our bowl of fresh eggs. OMG. We noticed that Porky wasn’t well when we first got back from Toliara, which was three weeks ago. So the putrid stuck-in-a-dying-chicken egg could have been that old too. OMG. One of us would have gotten very ill from that nasty nasty egg. I was rather emphatic and said that we did not want to eat that egg. Bakira seemed a bit surprised, but I offered it to him and he also said no way. So gross. BTW I am definitely off meat here. I had been open to eating chicken, because it is generally killed shortly before you eat it. Thus, it is fresh and not likely to contain Salmonella or E. coli or like bacterium. The other meat sits around in the hot sun in open markets and has flies swarming on it for who knows how long, so there is no way I am eating that. Recall that flies also swarm poop, and poor dead baby Maki before they swarm on your carcass/dinner. No way no how I’m eating that. But now that I’ve seen the swarms on my freshly killed Porky, ick, I am totally grossed out and will not be having any chicken either. Yuck. BTW2- I spilled gasoline all over myself a few minutes ago. Only in Madagascar would I refill a water bottle with gasoline, fill my generator and manage to douse my pants an foot in gasoline. Just saying. That poor hen! She must have been in terrible pain. I was sad to read that. And also, I've always been a bit iffy around eating eggs, and I think your story has put me off any egg dish for perhaps the rest of my life, as I will ALWAYS remember this if I should find myself deciding upon egg-anything. 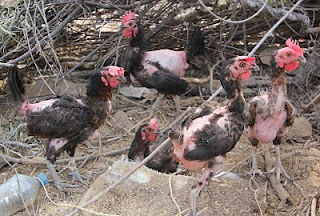 And why are your hens missing their feathers? And also, did you train these chickens to jump for crackers as we did in Tampolo those many years ago? Perhaps you don't have crackers at TNP. I know, poor thing. I kept hoping that she would get better and feel bad for not ordering the axe sooner. Sorry about tainting your eggs! 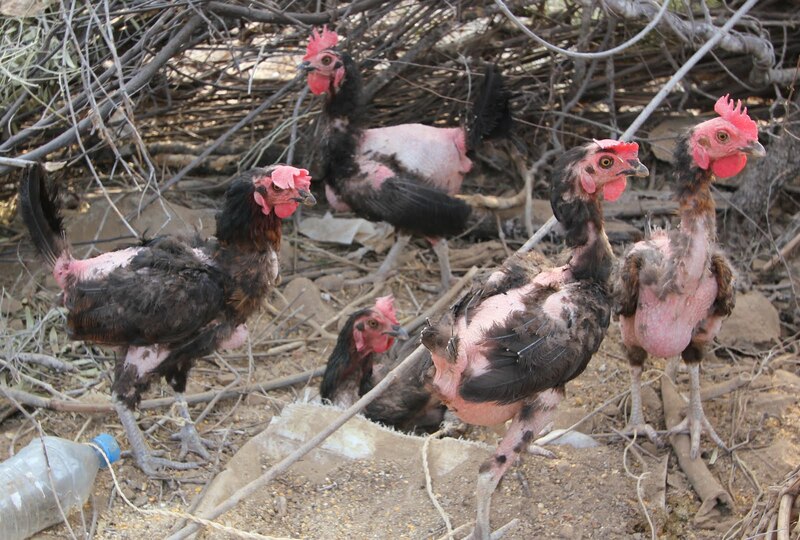 These hens are "vazah" and simply have few feathers. I also thought their feathers would come in, but no, they are all practically bald. You are correct, I don't have cracky, but I have learned to wrangle my chickens and put them to bed all by myself! Don't worry, I wash my hands well after and as of now, don't yet have a cestode!